Properties in Pouzy-Mésangy average 4.8 out of 5 stars. Property 1: Charming small house in peace, in large park. Lovely Country Cottage With Views, Pond, Garden & Terrace, set In 5 acres. Property 2: Lovely Country Cottage With Views, Pond, Garden & Terrace, set In 5 acres. Property 10: Gite bordered along a 14th century farmstead, with horses and a nearby lake. Property 11: Gite bordered along a 14th century farmstead, with horses and a nearby lake. Beautiful and large barn converted for the comfort of 12 people. Property 20: Beautiful and large barn converted for the comfort of 12 people. 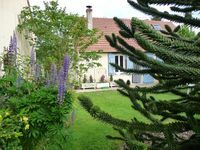 A wonderfully restful place in the French countryside, this place is clean, spacious and situated on a wonderful privately owned garden/park. The house was fully outfitted with all the conveniences of a modern home, was clean, and very comfortable, and conveniently located a few hours distant from Paris and near a beautiful village with lots of restaurants and shops. The owners where very gracious and welcoming to their secure and beautiful cottage. Thank you for a very nice stay. We booked this castle with friends in May, for one week. 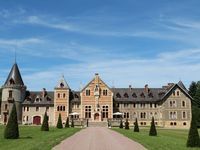 It is luxury and fully renovated castle, with different entertainments: pool, tennis, children playground ....... Very nice and clean place, what was important without any smell. Very good place for events and privet holidays.